Alieel enjoy the warmer, south seas of Crown Island. Their cold-blooded nature requires tepid waves to maintain their sly and energetic personalities. Its yellow fins surge with light. Alieel will charge the fins to the side of its head and emit a brilliant white light in a flash - dazzling enemies in an instant. Very acrobatic swimmers, they'll pull off dizzying maneuvers, shoot bubble jets, flash enemies and whip up whirlpools. Their favorite way to play with their kin is to attempt to outmaneuver and set their friends into a disoriented daze. 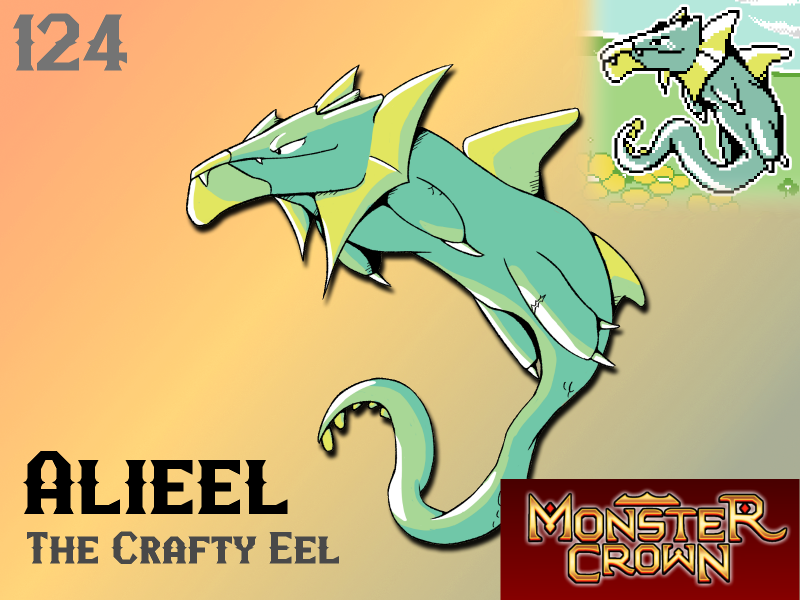 They are the most acrobatic aquatic monsters known and one of the few monsters to display a sense of humor. Inflicting the status conditions Reality Break and Electrical Burn out of sheer boredom, families of Alieel have been known to attempt to play even with Epheal. 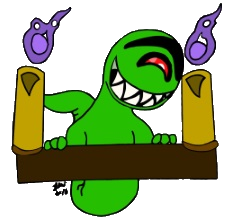 Unfortunately for the Alieel this quickly sours the mood as the Epheal will not even engage the monsters. The family quickly finds a way to lighten their moods however, as they soon return to their sonar-echo laughing. Will Alieel make your team? I'm still wary of the Vicious Typing, but I think a couple of my pals will love this guy.